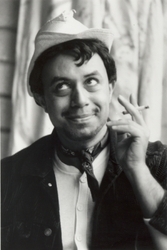 Commissioned by the Alley Theatre and San Francisco's Yerba Buena Center for the Arts, ¡Cantinflas! is a comic tribute to the late Mario Moreno Reyes, the "Charlie Chaplin" of Mexico. One of the greatest comics of his time, Cantinflas performed in over 50 films (including the smash hit Around the World in 80 Days) and engaged audiences with his sharp social satire and hilarious physical antics. Incorporating Spanish and English, this production recaptures the fusion of the comic's clever word play and his classic characterizations of the "everyman" and uses actual interviews that were conducted by Spanish-language press to illustrate the depth and genius of one of Mexico's most charismatic figures. 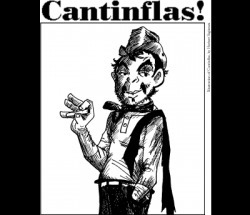 Originally workshopped at the Alley in the fall of 2001, ¡Cantinflas! was written by Herbert Siguenza of the performance comedy troupe Culture Clash, who also appears as the title character. 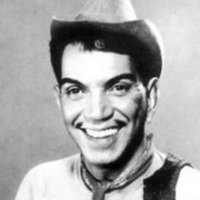 A small man with big ears, a distinctive mustache, pants that never stayed up, and a jaunty little cap cocked upon his eternally mussed hair, comic actor Cantinflas is beloved throughout the Spanish-speaking world and considered the Mexican Charlie Chaplin -- Chaplin himself hailed Cantinflas "the world's greatest comedian." Like Chaplin, Cantinflas' frenetic brand of slapstick was as balletic as it was athletic, leading others to compare him to Buster Keaton. His ability to combine humor with pathos was also decidedly Chaplin-esque, while his portrayal of the cocky, optimistic, but naïve little guy evoked Harold Lloyd. 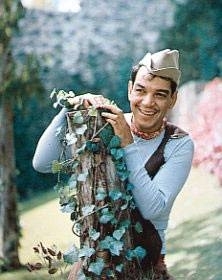 But despite such comparisons, Cantinflas' overall style was unique. Unlike the great silent funnymen to which he is compared, Cantinflas worked during the sound era. He usually played a smart-alecky peasant or average fellow and was famous for weasling out of trouble with the authorities by overwhelming them with intimidatingly pompous machine-gun speed monologues that, while sounding gloriously informed, signified absolutely nothing. Time and place: Mexico City D.F. 1993 Based on actual interviews Cantinflas conducted by the Spanish-language press over several years. The characters of Ramón and the American interviewer have been fictionalized. but his 1940 movie, Ahí está el detalle (That's The Detail or That's Exactly What I'm Talking About) makes him a movie star. The first scene takes place in the kitchen of an elegant mansion. Every night, Cantinflas visits his good-natured sweetheart who works for a very wealthy man. She wants Cantinflas to marry her and find a job, but he is more concerned about “mooching” from her and enjoying free food and drink. "Why work, when you are already working for both of us?" he says. In a later scene, he meets up with the suspicious wealthy man who believes he is having an affair with his wife. Cantinflas talks himself out of another tight situation. Cantinflas was a skilled comic bullfighter and a shrewd businessman. Cantinflas explains the history of the castle of Chapultepec to a gringo tourist with very bad Spanish —a sketch from the movie El bolero de Raquel (double entendre: Raquel's Bolero or Raquel’s Shoeshine Man). The next scene is the famous dance sequence from the same movie. Act Two opens with the red carpet Hollywood premiere of Mike Todd’s 1955 film, Around the World in 80 Days. This was Cantinflas’ first English-speaking movie and made him an international star. However, Cantinflas never had enduring crossover success and continued to produce Spanish-speaking movies in Mexico. Ramón enters and announces that dinner is served. Cantinflas invites the journalist to join him. 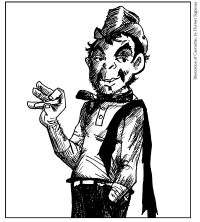 In the late 50's and 60's he abandoned his peladito (tramp) character and took on more conventional roles such as a double-tongued politician and a well-meaning teacher in a corrupt small town. He also played a town scribe with the gift of writing incoherent letters and coaxing free milk from the gullible milkman. Cantinflas lost some popularity during these years but returned as the peladito in El Análfabeto (The Illiterate). The scene depicts Cantinflas as a carpenter who has just made a very bizarre coffin much to his boss' dislike. His last movie filmed in 1982, was called El Barrendero (The Street Sweeper). The scene depicts Cantinflas and his sweetheart who is a maid. He confesses his love to her and promises her everything even though they have very little material wealth. The play ends with the interviewer asking Cantinflas a series of personal and insightful questions. 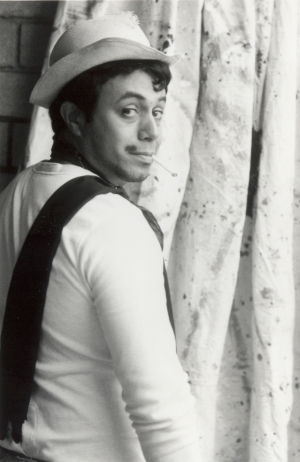 starring Culture Clash's member Herbert Siguenza as "Cantinflas"
and soon you may purchase online!